Railway | Poverty, Agony, Distress & Want! Writing a blog on a weekly basis isn’t as easy as it may outwardly appear (or maybe it is and I’m just not that talented). Though I may struggle a bit with the content, by far the most difficult part is trying to come up with a witty, clever title. Sometimes I hit and sometimes I miss (I’d like to more of the former, but in reality it’s probably more of the latter). This week was no exception. I had no idea what to call this week’s post, and then it hit me; I think it is very reflective of the week I’ve had. Besides, if Dickens can create something so popular why can’t I do likewise? Obviously it has been a very busy week once again…but what’s new. We are down to our final full week of classes before the start of exams and there is so much to do. I’m slowing chipping away at my backlog of marking and I hope to be cleared up by next Monday. My exams are in and the students have been given their exam reviews. Most of the teaching is now complete and we will be focussing on exam prep. Where has the semester gone? So, what’s been going on with the railway? Well, there are quite a number of things on the go. Last week I mentioned that my Leeblain article may have earned me another speaking gig, this time at the Thunder Bay Museum. There is nothing confirmed right now, but I may have the privilege to kick-off the 2013-2014 lecture season this coming September. I’ve never had the opportunity to speak at the museum, so I am really hoping that this goes through. It will certainly go a long way to promoting my work on the railway and our efforts to preserve the remains at Leeblain. On the topic of lectures, I need to get cracking on preparations for my February 9th presentation at Gunflint Lodge. I am looking forward to this event, as the lodge is a beautiful place and it’s located in one of my favourite areas. I have not visited Gunflint Lake in the winter, and so it should be a great experience. Hopefully we get more snow; this past week has been another wild temperature ride. On Friday it was +3C with rain, and Monday dawned at a crisp -19C. We lost a lot of snow with the rain and it would be nice to get more before my visit. Alright, so what’s with the locomotive thing? Well, it has actually been an ongoing situation for quite a while now; I even wrote about it last June (ironically in that post I was complaining about how hot it was). The story involves the most famous locomotive on the PAD&W, affectionately known as the “Black Auntie.” Her nickname stemmed from the fact that there was reputedly the image of a woman on her firebox door which apparently resembled a local Madame by the name of Julia Ann Roy. So the issue lies with the fact that accounts of the type and appearance of the Black Auntie do not jive with historic information. Traditionally the Black Auntie was describe as a 0-4-0 locomotive; however documents suggest that rather it was a 4-4-0 “Rogers” type engine. There is a photo that purportedly shows the Black Auntie on an excursion in 1890-1891. However it lacks the necessary detail to make a thorough analysis. So I sent for an image of PAD&W #1 from Library and Archives Canada and what I received completely baffled me (unfortunately I cannot post the image as it is property of LAC). 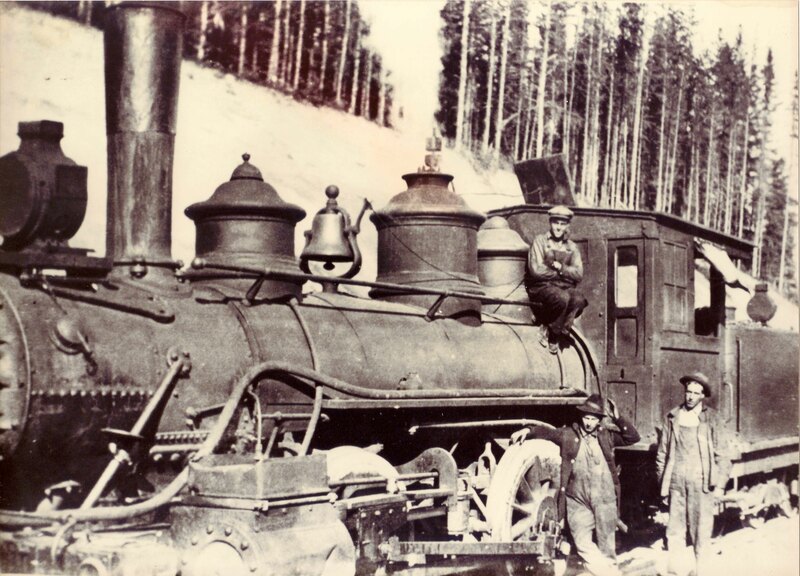 The engine in the photo is appears to fit the historic description of a 4-4-0. There are some similarities with the excursion photo, but the archives engine looks longer and newer. The Black Auntie was heavily damaged in a January 14, 1891 engine house fire and needed extensive repairs. Could this account for the differences between the two? A plausible explanation. Compounding the whole issue is that there is another photo floating around that may also be the Black Auntie, but it looks nothing like the other two (and the front of the engine is not visible to see if there are leading trucks-the small wheels at the front). Unknown PAD&W engine, unknown date. I have ordered some additional images from the Archives that will hopefully aid in this investigation. This mystery has been absolutely frustrating; the more I dig, the more confusing it gets. I can certainly appreciate how challenging it can be for others who are doing similar types of research. I hope that I will discover some information that will help solve the curious saga of the enigmatic iron horse. Dave, are you suggesting that you are on the same literary plane as the great Ernest Hemingway? Surely you jest! Yes, I am kidding. I am certainly no Hemingway…he wrote fiction. Come on, I’m more like Pierre Berton, probing the depths of 19th century Canadiana. I have the same hairdo…now I just my own T.V. mini-series! Back to the reality that is my life, unfortunately the Christmas holidays are over. Yes, I have returned to work. Sigh. All good things must come to end right? It isn’t so bad, though it is a bit of a struggle to get into the routine of things. Isn’t that funny; when you go on vacation you’re tired from working, and when you come back you’re tired from being on vacation. Can’t ever win can you? Anyway, things are rather busy and chaotic as there are only two and a half weeks before exams start. I still have a pile of marking to get through, marking that I did not get to on the break (because I was busy writing). There are exams to look at, and lessons to finish. I think I’m gonna need another break after I’m done all of this! Unfortunately school is not the only thing that is keeping me busy for the foreseeable future. There are some projects around the house that need attention, swimming lessons have begun again and hopefully we can get some skating in there too. On top of that, I have a presentation on the railway at the beginning February to get ready for and I have some football related stuff to get to. Yikes! So with all this other excitement going on, you’d figure I wouldn’t have railway time. Wrong! In reality I managed to get quite a bit done, more than I expected. Most of my efforts had been directed to writing, but I did get a little research in too. I managed to come across a few new railway time cards, one from 1906 and the other from 1910. I also landed myself an original railway document from eBay and was unfortunately outbid on another three. I was smart enough however to save the images for the ones I missed so I could use them as references! Duluth Section Timecard, November 1906. North Lake Branch Timecard, June 1910. 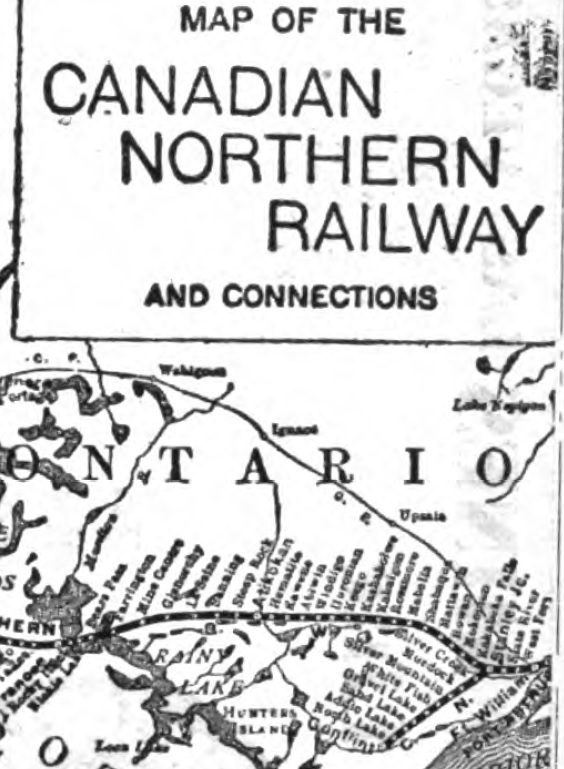 Canadian Northern Railway map, 1906. I have been writing over the past few weeks about my attempts to finish my article on Leeblain. It was a tough slug, but I am done! Five thousand eight hundred and eighty-two words…by far the longest thing I’ve ever written! I am very proud of myself. Immersing myself in the history of the railway and this ghost town was a very gratifying experience. Certainly gives me a lot of confidence to move forward to bigger and better things. I’ve submitted the article to the Thunder Bay Historical Museum Society for inclusion in their annual Papers and Records publication. I am hoping that it is accepted. My work may have earned me another presentation date, this time at the Thunder Bay Museum. We’ll see what happens. On a final note, last week saw some very important anniversaries in the history of the railway. 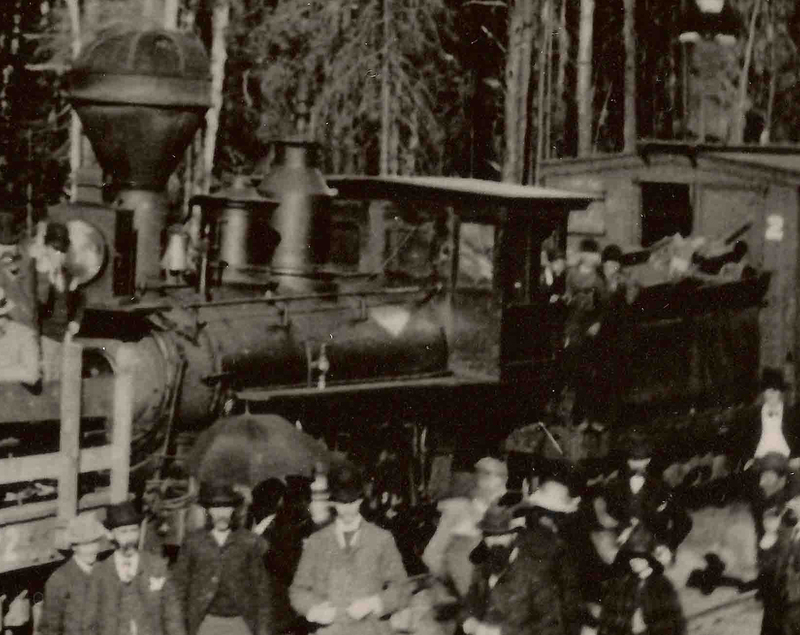 January 4th 1893 was a special day; on that day the railway was completed all the way to Paulson Mine, Minnesota and toured by a train full of dignitaries. It also saw the incorporation of the aforementioned town of Leeblain on the shores of Gunflint Lake. I wonder what it would have been like to be a fly on the wall 120 years ago and witness those events! I really wish there were photos of the events, or better yet, I wish we could find them if there are. 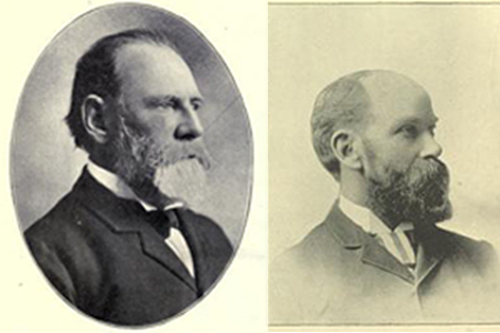 Arthur B. Lee and Hugh Blain. Who came up with that one? So I actually Googled Auld Lang Syne as for years I’ve always wondered what the heck it meant. “Old long since” or “long, long ago”…who would have thunk it? I didn’t know it was based on a Robbie Burns poem either. Then again I’m not up on my 18th century Scottish literature; I should get on that. While I’m at it, I’ll finish all those books on my reading list and write a bunch of history articles! All kidding aside, it is a new year. Welcome to 2013! Let’s hope that the thirteenth year of this new millennium is a good one. I know that I have a lot to be thankful for and I really want this to be another great year. However, like everyone else out there, my first big challenge for the next few weeks is going to be not writing the date “2012” on everything! Once again my New Years was low-key, but that’s to be expected with young kids in the house. We had some friends and their kids over, ate the traditional Chinese food dinner and let the kids stay up to 10 o’clock. Certainly makes for some nicely wired children! It’s all good though; I can barely make it to midnight, let alone party the night away like when I was 21. After just celebrating my (ugh) 39th birthday, I’ll have to content myself with little victories! The past week has been very relaxing and enjoyable. I forgot how nice it is not to go to work! Christmas Day was a bit chaotic, but that’s to be expected. The kids tried to wake up at 5am, so we had to remind them that 7:00 was the approved time; too bad I couldn’t fall back asleep after that. My wife and I usually don’t exchange gifts for Christmas, but fortunately the boys had some things that I could play with too. We decided to buy them an Xbox Kinect this year as we thought it was a system that would get them moving and was family friendly. It is funny how sore you can get playing interactive boxing against a 5 year old! The only sour note has been the weather. It was so mild before Christmas that this little cold snap we’ve been experiencing is a bit disconcerting. I must be getting soft though, because it wasn’t even that cold; minus 20 is not really that cold! The biggest problem is that the cold temperatures, coupled with the lack of snow, really takes away a lot of outdoor options. We wanted to go tobogganing yesterday afternoon, but it was just way too cold with the wind chill. Things are supposed to warm up a bit (-6ish) in the next few days and we’re supposed to get some more snow. I really hope it happens so we can start doing our traditional weekend walks up the mountain. Trail, Norwester Mountains, December 2012. With all the free time I’ve had over the break I was able to get a lot of railway related work done. I even did some research! I can’t remember what I was looking for, but I happened to come across an old map which has been a great source of information. I written on many occasions how the digitization of information has transformed historical research and I cannot say enough good things about it. The information on the website stated it was from 1926, but on the date on the map was 1917. It shows the area of Lake and Cook Counties in northeastern Minnesota, as well as portions of the Canadian border area, so it is of huge value to me. I was able get some great information from it, both for my research and for my efforts with the Silver Mountain Historical Society. This map is part of the collection held at the Cook County Historical Museum in Grand Marais, Minnesota. The museum is one of the institutions that has been very helpful to me over the years. My first contact with the CCHM was back in 1997 and then director Pat Zankman. Pat and I spent a lot of time pouring over old documents and sharing information. I had not been to the museum in over ten years when I met Pat there this past July; it was great to catch up with her and see what was new in their collections and displays. I would certainly recommend a visit next time you’re through Grand Marais. Cook County Museum, July 2012. Most of my railway time however was devoted to work on my Leeblain article. I actually was able to do a lot of writing…I’ve very proud of myself. Even though I still have quite a bit to go, I added another four and a half pages of information and I’m up to about 3400 words! The biggest challenge by far has been to decide what to include and what to leave out, as this is just an essay and not a book. It is very tough though, as you want to make sure everything makes sense. In any case I am getting a ton of experience with writing, formatting and documenting historic papers; it will certainly serve me well in the future. Now I have to figure out how to make a cool looking homemade map! Anyway, I think it’s time to wrap things up…I have an article to finish! I’m going to try and enjoy the rest of the week before its back to work next week. Until then…Happy New Years!